What makes a machine the best ever? Is it a hand-crafted machine that echoes the designs of a century ago with the technology of today? Or is it a machine that is built to perform like an AC Cobra. 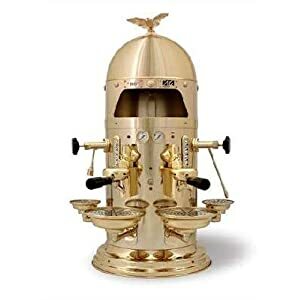 If your fascinated by a classic Rolls Royce with shiny chrome and soft leather you’ll love the VFA Gold Dome 1930 Espresso Machine . It’s built with Brass for good looks and stainless steel for longevity and easy maintenance. Here’s a video of the VFA factory in Spain. CoffeeGeek has a different criteria for the perfect espresso machine. They look at Ferrari and Cobras for inspiration. The aptly named Speedster is a masterful hand-built machine that takes coffee to a new level. I even got a chance to pull shots on it, and immediately felt this was a singular moment in my coffee and espresso career (and to put that into perspective, I was at a meeting for the development of the GS/3!). Everything “clicked” – the machine felt comfortable. It steamed exceptionally well. The paddle group put you, as a barista, in direct connection with the machine. It was tight, light, solid, beautiful, industrial, exceptional all at the same time. From that very moment onward, I had it in my mind that, if I ever won a million dollars, I’d make an offer on this machine so I could own my own – and the offer wouldn’t be cheap. After all, van der Westen built only six of these and by 2002, was already saying that was that – there were six and there would be no more. Speedster Espresso Machine Exposed Portafilter Extraction from Mark Prince on Vimeo.